Born: 13 February 1872, Bath, United Kingdom. Died: 24 February 1947, London, United Kingdom. Matthew W.K. 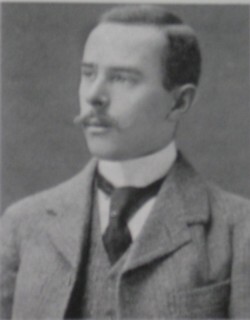 Connolly, British soldier, conchologist, stamp collector, expert on pedigree racehorses and lover of the culinary arts, was the son of Vice-Admiral Matthew Connolly and his wife Harriet Kemble. He trained at the Royal Military College, Sandhurst and was commissioned into the King's Own Yorkshire Light Infantry as a second Lieutenant in November 1891. He was appointed adjutant of the Second Volunteer Battalion, Royal Warwickshire Regiment, in April 1900 and sent to South Africa with his regiment during the Anglo-Boer War (1899-1902), even though he was not in good health. In May 1905 he returned to regimental duties and from that time spent much time in South Africa, being promoted to major in July 1910. Connolly was involved with signalling operations and spent long times at isolated signalling stations in the veld, which enabled him to collect snails. He amassed a large collection and Henry Burnup* became his mentor. From 1907 he sent Burnup numerous specimens for identification, and later also the manuscript of his first paper for comment. In 1909 he presented a collection of South African land shells to the South African Museum, Cape Town. During 1910-1911 he revised the museum's freshwater and land shell collections and compiled "A revised reference list of South African non-marine mollusca, with descriptions of new species in the South African Museum", a monograph that was published in the museum's Annals (1912, Vol. 11(3), 244p). Further "Notes on South African non-marine mollusca" followed (1914, Vol. 13(4), 80p, with an anatomical part by H. Watson; 1915, Vol. 13(5), 14p). In December 1912 Connolly went on the half-pay list as a result of ill-health resulting from rheumatic fever and in May 1914 retired from the army. During World War I (1914-1918) he worked in the army record office and after the war became an honorary scientific worker in the British Museum (Natural History) where he worked until December 1946. During these years he devoted himself to conchology and malacology and soon became the foremost authority on southern African land and freshwater shells. Collections from all over the country were submitted to him and he published some 50 papers on molluscs between 1910 and 1945. His most important publication was "A monographic survey of South African non-marine Mollusca" (Annals of the South African Museum, 1939, Vol. 33(1), 660p), which despite its now outdated approach to taxonomy remained the most complete reference work on the subject for the rest of the twentieth century. He also compiled comprehensive descriptions of "The non-marine Mollusca of South West Africa" (now Namibia; Annals of the South African Museum, 1931, Vol. 29(2), 60p) and "The non-marine Mollusca of Portuguese East Africa" (now Mozambique; Transactions of the Royal Society of South Africa, 1925, Vol. 12, pp. 105-220). Some other papers by him were published in the Annals of the Natal Museum: "New non-marine mollusca from South Africa" (1929, Vol. 6(2), pp. 219-244), "New South African Gulellae..." (1932, Vol. 7(1), pp. 67-90), and "On South African Entodontidae" (1932, Vol. 7(1), pp. 91-104; 1933, Vol. 7(2), pp. 145-150). As a result he has been called "the real colossus of South African non-marine malacology" (Herbert & Kilburn, 2004, p. 54). During his last years he was working on a supplement to bring his 1939 monograph up to date. The snail species Gulella connollyi and Afrodonta connollyi were named in his honour, as was the marine mollusc Glycimeris connollyi. Connolly was a member of the Malacological Society from 1908 to 1938 and was president of the Conchological Societyin 1930. He was married to Muriel Maud, born Vernon, with whom he had a son. Annals of the Natal Museum, 1929-1933, Vol. 6 and 7. Obituary: Major M. Connolly. Southern African Museums Association Bulletin, 1947, Vol. 4(2), p. 48.